Nightmares and Dreams - Why Do Nightmares Occur in Your Dreams? Home » Nightmare Interpretation » Nightmares and Dreams – Why Do Nightmares Occur in Your Dreams? For a very long time, the ‘dream’ has always been an unknown which causes headache on all the scientists around the world. It comes and goes without following any specifically logical order of humans. You may start the dream through a scene of a fun party, but suddenly, you could be plunged into a dangerous chase. Till now, no one enables to answer these phenomena; however, the sure thing is – the dream analysts know exactly the relation between ‘Nightmares and Dreams‘. According to them, dreams can be entertaining, disturbing, and downright bizarre at the same time. 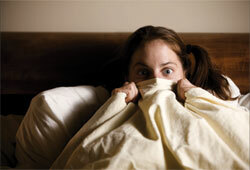 When being affected by ‘different’ dreams, we may become freakier, crazier. We all dream, at least once, even if we have no idea what just happened last night in the next day. Interestingly, do you know what element changes your dream? People rarely know, but ‘magnetic field’ is the major reason making humans’ dreams become weird. You might be having fun with friends, all of sudden, you could be attacked by…aliens or giant insects – of course, everything is just in a dream. Why Do We Dream? What is The Mystery of Nightmares? Let’s find out the truth about dreams via this article – dreams are basically stories and images created by the unconscious in our mind while we sleep. A person’s dreams can be vivid, since they bring him mix emotions – happy, sad, anxious, or scared. And, dreams may seem confusing or perfectly rational. They often occur during sleep, the REM (rapid eye movement) sleep, when the brain is most active. The ‘Study of Dreams’ points out that a person normally dreams at least 4-6 times every night, and last longer as the night progresses; the final REM period is estimated to last about 45 minutes. Why do nightmares happen? 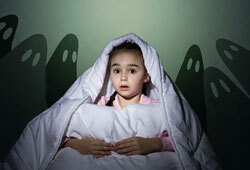 Nightmares (or bad dreams) are the special phenomena which commonly occur in both children and adults. There are a variety of theories about why we experience nightmares, but they are often caused by: stress (conflict or fear), trauma, emotional problems, medication or drug use, and illness. When you have a recurring nightmare, bear in mind that your subconscious may want to tell you something, Listen and remember it well – if you continue to have it, talk to a qualified mental counselor. You will figure out the cause and receive tips to deal with the problems easily. No matter how serious your nightmare is, it is not real and won’t happen to you in the real life. Both dream and nightmare can reflect your own underlying thoughts and feelings – the deepest fears, concerns, and desires. By getting ‘nightmares and dreams interpretation‘, you are able to gain insights into your life and your true self. While dreaming, you could come up with some unique ideas, so dreams are considered as a conduit of creativity. 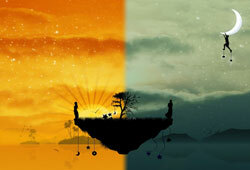 Send us your feedback for the topic: “Nightmares and Dreams” , and we will soon reply to you all.